Showing 43 articles from February 9, 2016. Two people died in a collision that happened on Friday, February 5 at 4:53 pm on SR 6 at mile post 49, which is about 2 miles west of Chehalis. The Town Crier had the honor of being invited to the capital to shadow Representative J.D. Rossetti as he went about his day, giving insight into the daily life of a Washington Lawmaker. In the last issue of the Town Crier after Rep. Rossetti brought a new house bill forward in a meeting with the Agriculture and Natural Resources Committee, after which it was time that he head out of this meeting and into the next, though the meeting was not over. Rossetti finished presenting and turned and left the room directly out of the closest door, as one of the security personnel came over to warn me that I needed to follow. Crime Stoppers of Lewis County and the Lewis County Sheriff's Office are seeking your assistance with a burglary investigation which occurred in the 200 block of Guerrier Road, in Chehalis. Fresh out of the election time, Lewis County Fire District welcomes Jerry Craft as a new commissioner. The next meeting of the Lewis County Genealogical Society is Tuesday, February 16, 2016 at 7:00 p.m. at the St. John's Lutheran Church, 2100 Jackson Highway in Chehalis. Detectives responded to a report of a body found lying on Mandy Road, in Toledo, on February 4 at approximately 8 p.m.
Unofficial results for the February 9, 2016 Special Election are available after 8:00 pm on election night at: www.vote.wa.gov/lewis. Come join the Winlock Elementary on February 17 for their reading night. All parents and students are invited. This looks to be a pretty busy week, activity-wise. For the ladies, Wednesday is the Women's Club monthly luncheon meeting at noon in Pioneer Hall. It is their annual Baked Potato lunch, so members bring toppings to share. All ladies in and around town are invited. 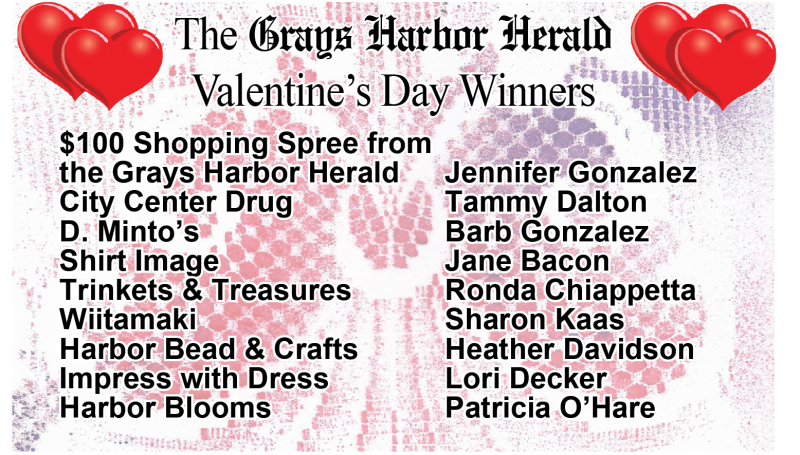 Then on Thursday, the Red Hat ladies Gather at 2 p.m. in Pioneer Hall. Among other things, they will plan for their monthly Outing on the 25th. After Mia Suhrbier's amazing success at the Make-it-with-Wool State Competition, she traveled to Scottsdale, Arizona for Nationals. Photo by Kennedi Collins - Haley Tauscher looks for an open teammate through the mob of Pirates. On Thursday February 4 the night had come where the Toledo Indians would have to part with their seniors. For the senior night game Toledo took to the court against the Adna Pirates. Cyndi says: This year's Cheese Days theme: "Giving Back." Our intent - to bring awareness and appreciation to community volunteers, specifically Toledo Lions Club, volunteer Fire Department (and) EMT's, Food Bank and Senior Center. On the first night of February the Toledo City Council met together for their first meeting of the month. 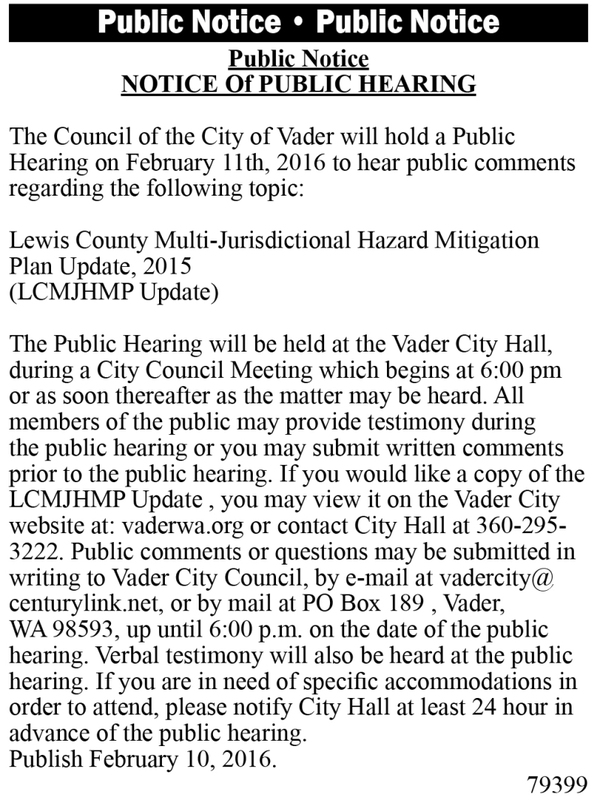 At 6:00 pm Mayor Steve Dobosh called the Meeting to order. After the flag salute Mayor Dobosh notified the Council that Councilman Jim Fluckinger was excused for being absent. Following this announcement the Council moved into their time of Department Reports. Photo by Kennedi Collins - Nick Patching of Winlock looks for an opening as he goes to dribble around his opponents. As the basketball season draws to an end, the arch rivals had one more game to face each other. On the night of January 29, the Toledo Indians and Winlock Cardinals faced off against each other for the last time of the season. Ok who told the daffodils its SPRING? Three of my "greenhouse loving" gal friends are planting this month! Yeah I love pink petunias. 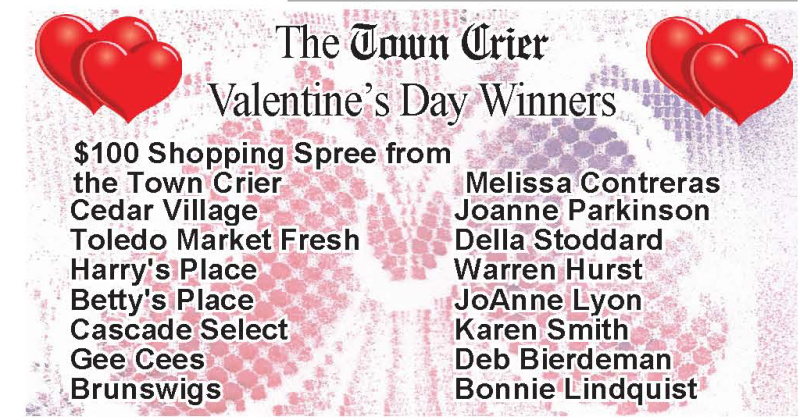 Remember Wikes Nursery does hanging basket fundraisers for your club so give Brenda a call early. Do you ever have those days when you think about how simple things were when you were young? I have been thinking recently about what Winlock was like when I was a young girl and we lived downtown, it really was a small town America. It seemed like you knew everyone in town and they knew you, you wouldn't dare do anything wrong because the entire town would let you known you were in trouble! I can remember us girls going in to the Ben Franklin store; let's not forget going to see Norma at the Rexall Drug store and stopping off at Safeway to see my mom who worked there. It was such a wonderful upbringing and even though I moved away for the career in the big city, I just had to come back to be in this wonderful community where people care! Two people dies in a collision that happened on Friday February 5 at 4:53 pm on SR 6 at mile post 49, which is about 2 miles west of Chehalis. The Chinook Tribal Council Meeting is on February 13 at the Tribal Office in Bay Center from 11am to 4pm. Bring a dish to share at the potluck lunch. 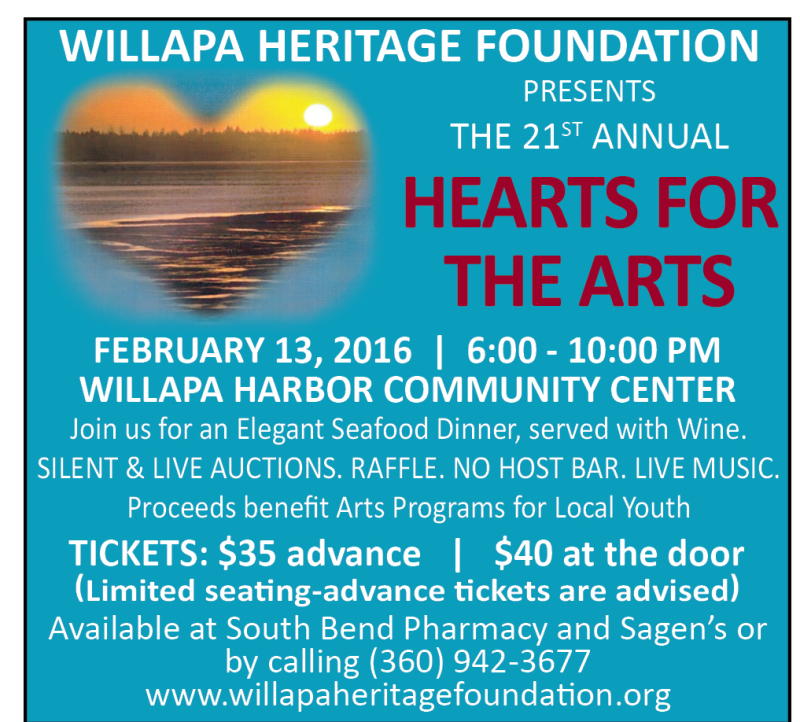 The Willapa Heritage Foundation is holding their 21st Annual Hearts for the Arts dinner on February 13, at the Willapa Harbor Community Center starting at 6pm and going until 10pm. Judge Michael Sullivan has discussed his intention not to seek another term as Pacific County Superior Court Judge. This is no small thing. Judge Sullivan has presided over the Court during a period that saw an unprecedented number of difficult and sensational cases at a time of significant budget cuts and the loss of key personnel. To improve the health and well-being of the community by providing quality and compassionate health care services in a patient centered atmosphere respecting individual and cultural diversity. SOUTH BEND - Marshall N. Disney, 26, of Bay Center, pleaded guilty to attempted first degree burglary and escape from community custody. 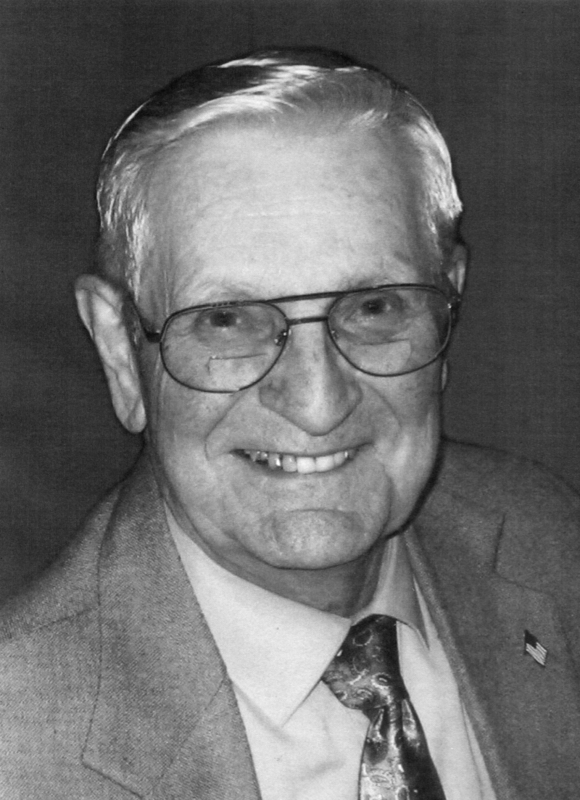 In Loving Memory of Charles L. Everitt, Sr.
Charles L. "Charlie" Everitt, Sr., passed away at the age of 91 on January 25, 2016, at his residence in Hoquiam, Washington, following a brief illness. 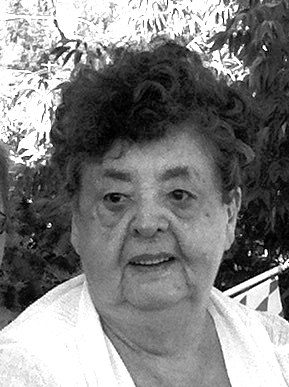 Inge passed away on January 28, 2016. Photo by Larry Bale - South Bend HS senior Tyson Johnson pulls down a rebound against the Ocosta Wildcats on Senior Night. The Indians lost 62-48 Friday night at Koplitz Field House to drop to 6-14 heading into Monday\'s district game (Feb. 8) at Toledo. Ocosta whacked South Bend 62-48 Friday night at Koplitz Field House. The Wildcats established a school record for victories during a regular season with 19 - breaking the record of the 1971 State title team for Class A. Photo by Larry Bale - Raymond HS Senior Kinsey Collins works in the key on the offensive end versus Ilwaco at Seagull Gym last Thursday on Senior Night won by the Lady Fisherman. Despite their top player sick and playing with a deep bruise on top of her foot, the Raymond Lady Seagulls soared over South Bend's Lady Indians 57-38 last Tuesday (Feb. 2) at Seagull Gym. A Montesano man, Daniel Seth Franey, 33, was arrested early Saturday morning on five counts of unlawful possession of a firearm and held at the Tacoma Federal Detention Center. Franey was arraigned in U.S. District Court in Tacoma on Monday February 8. 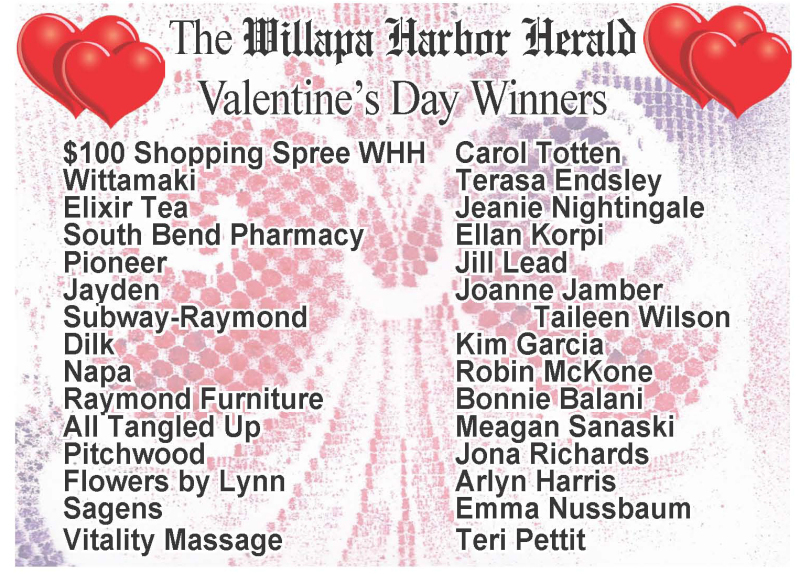 This story was provided to the Willapa Harbor Herald by the Chinook Observer. The Pacific County Public Utility District Number 2 met for their regular bi-monthly meeting on Tuesday, February 2. General Manager Doug Miller started the meeting with the approval of minutes from the previous meeting as well as the current meeting's agenda. After Miller moved to approve the minutes from the previous meeting, he listed off the organizations he had received letters from in the last two weeks for correspondence. Miller next moved to the manager's report. I have never understood how the Pacific County PUD #2 became Mr. Ron Craig's bête noire. North Pacific County Emergency Medical Services District #1 (NPCEMSD #1) is reducing the amount requested for the excess levy that voters approved in November of 2015 by $100,000. This District provides emergency medical services through contracts with the City of Raymond and the Naselle Volunteer Firefighters Association and covers Pacific County Fire District's 3, 4, 6, 7, and 8 along with the City's of Raymond and South Bend. Seaview- A change in how Washington State Republicans allocate votes for the 2016 Presidential Nominee means local Republicans will not be voting for their choice of President at the February 20th Caucuses. Instead the primary vote on May 24 will determine who the delegates elected to the national convention will support. I will be running for re-election. 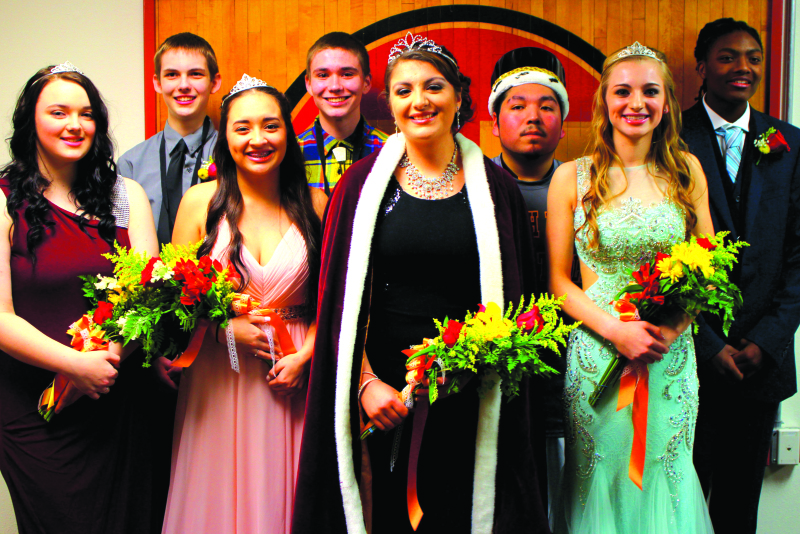 Photo by Larry Bale - From left are SBHS seniors Sage Baker, Jacob Strozyk, Sinda Chann, Barret Houk, Queen Diana Morales, King Miguel Morales, Hannah Byington and Cody Jones. The South Bend City Council met the evening of Monday, February 8 for a regular bi-monthly city council meeting. The meeting was started by Mayor Struck calling the meeting to order and starting with the pledge of allegiance. The council approved the minutes of the previous meeting as well as the current agenda for the night's meeting before hearing the items from the public. State shellfish managers have proposed two days of razor clam digging in February at Copalis beach in addition to an approved a month-long opening at Long Beach that starts Thursday. Willapa Valley closed out the season with six consecutive losses after falling at Ilwaco and at home against North Beach. The Vikings ended the season at 8-12 and tied for ninth place in the 11-team Pacific League. 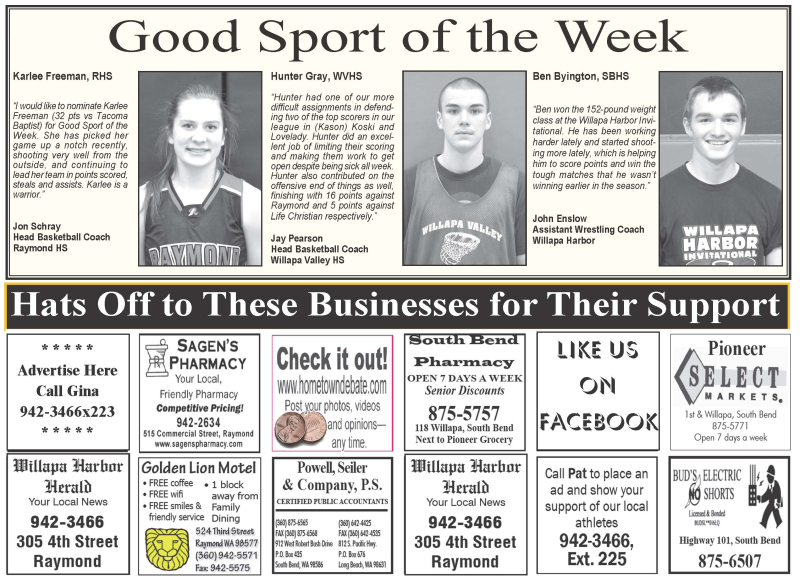 Willapa Valley ended a difficult boys' basketball campaign with two losses last week versus Ilwaco and at North Beach.